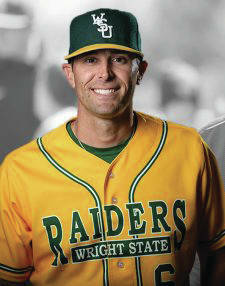 FAIRBORN — Alex Sogard, an assistant coach at Wright State Universiy for the last two years, was named the Raiders head baseball coach. He replaces Jeff Mercer, who accepted the head coach position at Indiana University. The North Carolina State graduate primarily worked with the pitchers but was involved in all aspects of the program, which finished the 2018 season 39-17 overall and 22-6 in the league, won regular season and tournament titles and went to the NCAA tournament. Sogard was also instrumental in helping Wright State to its first top 100 recruiting class (87th) in 2018. In 2018 the Raiders pitching staff finished the season ranked nationally in earned run average, hits allowed per nine innings and WHIP. Three players were selected in the 2018 Major League Baseball draft, including two pitchers. Starting pitcher Ryan Weiss was selected in the fourth round by the Arizona Diamondbacks and 129th overall. Weiss posted a 9-2 record with one save and 92 strikeouts over 98 innings in 2018. He was named to the All-Horizon League first team and second team All-Region. Starter Caleb Sampen was selected in the 20th round by the Los Angeles Dodgers. Sampen went 5-0 in 11 appearances with a 3.26 ERA and 33 strikeouts in 47.0 innings. Horizon League Player of the Year Gabe Snyder was taken in the 21st round by the Minnesota Twins. In Sogard’s first season on Wright State’s staff in 2017, the Raiders garnered their top 25 ranking and finished the season 38-21 and 21-9 in the Horizon League. The Raider pitching staff compiled a 3.70 ERA and broke the all-time program single-season strikeout record with 423. Raider baseball has been one of the most successful programs in the midwest since 2006, advancing to six NCAA tournaments, including the regional finals in 2015 and 2016. During that stretch, Wright State won six Horizon League tournament titles and five regular season crowns. Sogard was drafted by the Houston Astros in the 26th round of the 2010 MLB draft and played seven seasons of professional baseball. In his first full season with the Astros organization, he led the Single A Lexington Legends in strikeouts. He advanced as high as AAA and was selected to play in the Arizona Fall League in 2012 with the Mesa Solar Sox and in 2013 with the Peoria Javelinas. He also played in the Arizona Diamondbacks and Baltimore Orioles organizations. Sogard worked as the pitching instructor for several elite camps, including the Pro 5 Academy in Raleigh, N.C. The 30-year-old started his collegiate career at Oregon State, when the Beavers won back-to-back national championships in 2006 and 2007, before moving to North Carolina State for his final three collegiate seasons. In 2008, Sogard closed the regional championship game against South Carolina to win the Raleigh regional. His career also includes playing in the World Baseball Classic for Team Czech Republic in 2012 in Germany and 2016 in Mexico. His brother, Eric, is a member of the Milwaukee Brewers. Sogard graduated from North Carolina State in 2010 with a bachelor’s science technology with a specialty in nutrition and exercise science. He and his wife, Arlie, have two children, Fisher and Penny.